Want to add more functionality to that jacuzzi? 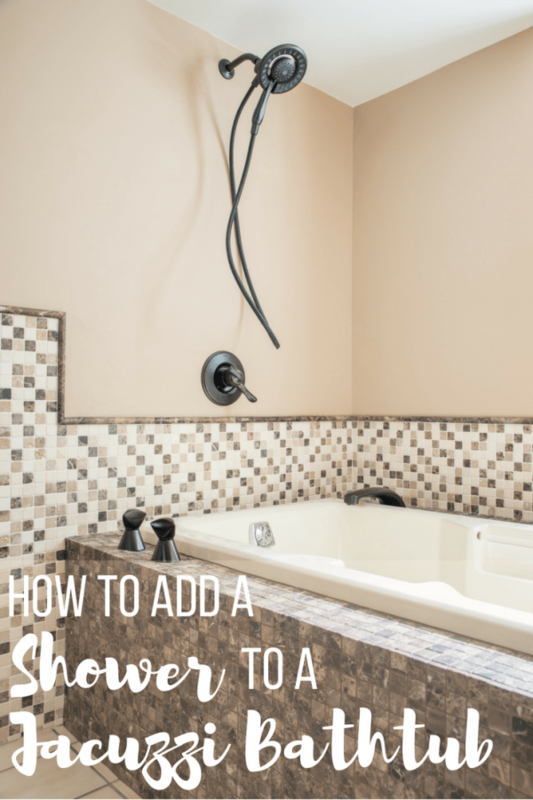 Add a shower to the tub! There are a few different ways you can go about this task, each with their own pros and cons. I’ll walk you through the options, then show you what I did in my own bathroom! Remember when I declared that my bathroom remodel was finally complete? Well, home improvement never stops around here! It seemed like such a shame to have a beautiful bathroom with a huge tub that doesn’t get used very often. We decided to add a shower to the tub to make it more functional and put it to better use! This post is sponsored by Mr. Rooter Plumbing, and contains affiliate links for your convenience. Purchases made through these links may earn me a small commission at no additional cost to you. The layout of our bathtub surround made installing a shower a little tricky. 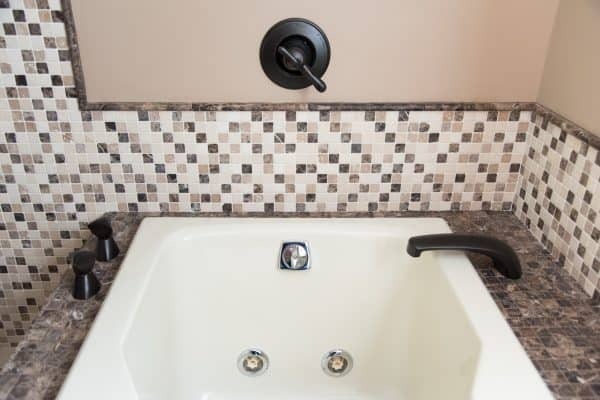 The deck-mounted faucet is off to one side, with the handles on the other side of the tub. 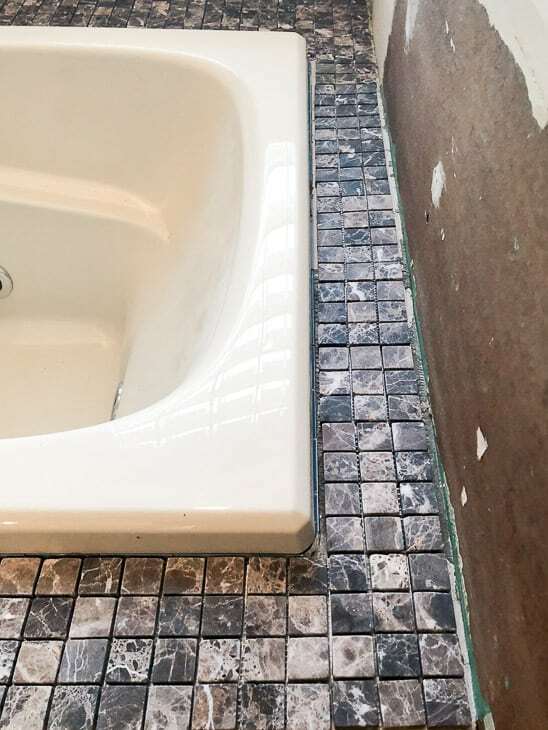 I wanted to avoid ripping out any of that tile that I so painstakingly installed just a month ago. I did some research and came up with three options for adding a shower to a tub. 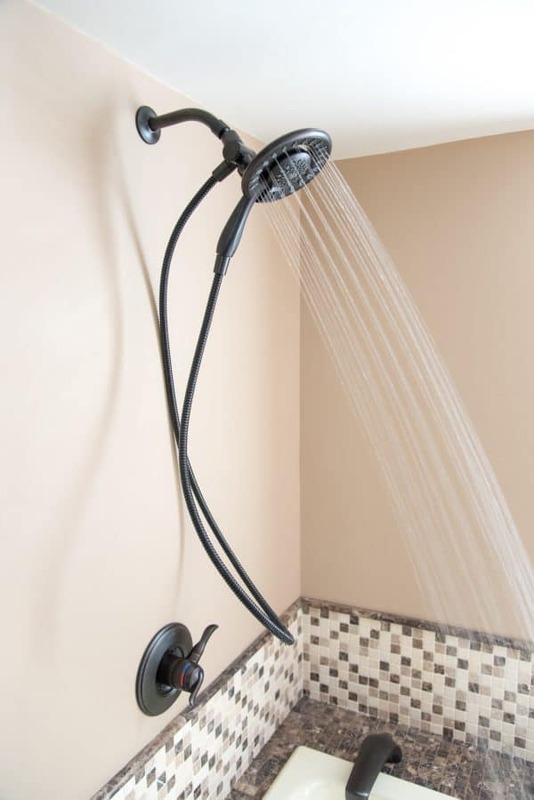 If the faucet was mounted at the end of the tub, it would have been easy to install a diverter tub spout with a connected shower head like this one. You can also find a few options on Amazon here. Alas, nothing about this bathroom renovation is that easy! The faucet is deck mounted, which means the plumbing comes up from underneath, rather than out from the wall. In addition, a wall mounted spout would have to be almost a foot long to span this gap. That would look pretty ridiculous! 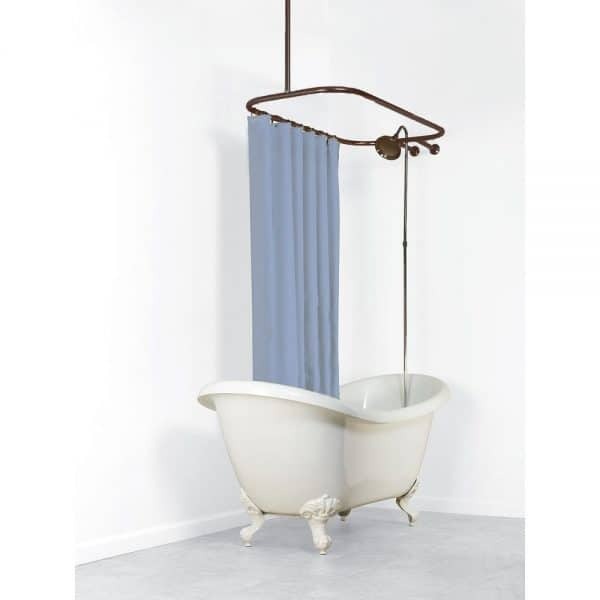 The second option was a Roman tub faucet with a hand shower. Here are a few examples. All these homes have a stand-alone shower next to them, so the hand shower is merely for rinsing off bubbles from the bath. Showering while seated is a tricky endeavor and not really the convenient option we were looking for. Plus, this would involve rerouting the tub handles over to the spout and tearing up my newly laid tiles. No thanks! In the end, we decided to install a shower head on the wall with its own valve to control the water flow. 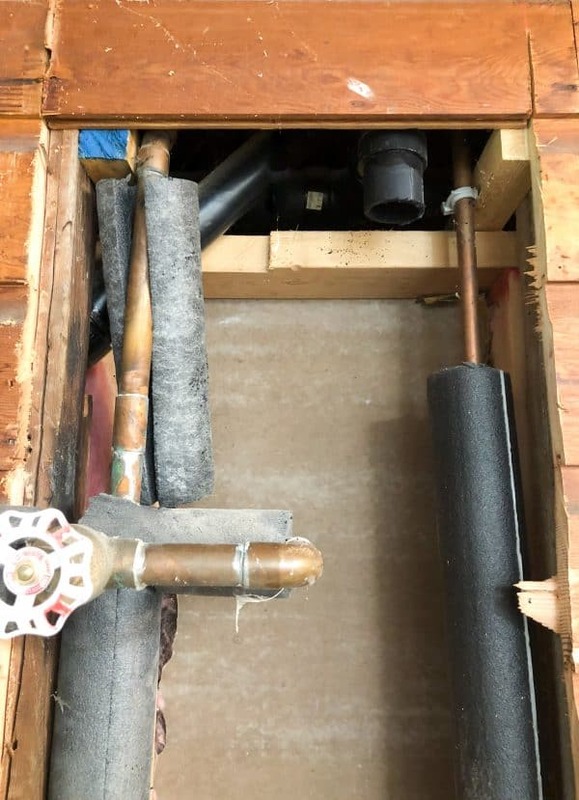 This option allows us to keep the existing tub plumbing intact, and won’t destroy all my hard work! 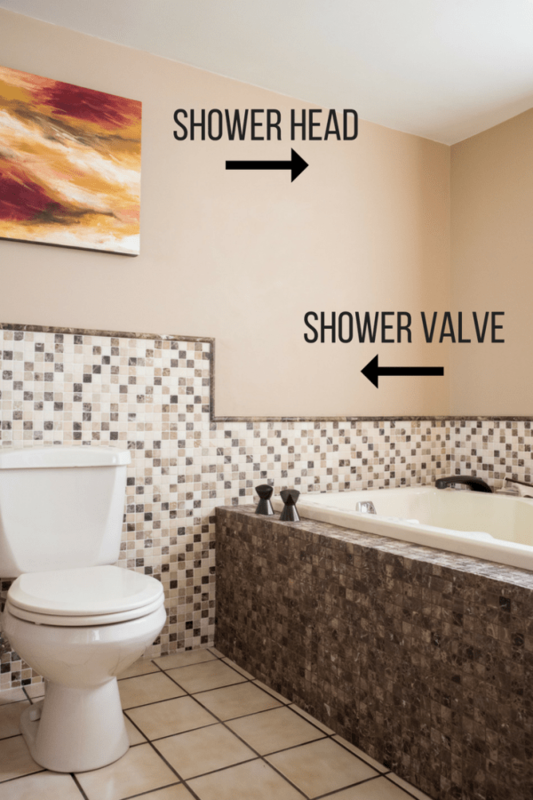 The shower valve on the wall will be less confusing for guests to use, because it’s more obvious that those controls operate the shower and not the tub. The shower head I chose has a removable hand shower, so we can rinse off after soaking in the tub without draining it first. This will also make it easier to clean. For a project like this, it’s best to call in the professionals. 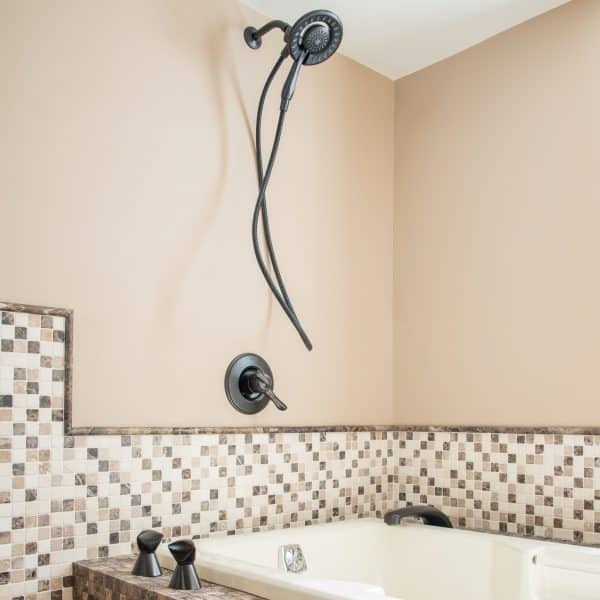 I’m thrilled to be working with Mr. Rooter Plumbing to add this shower to our bathtub! One of their technicians came out before the scheduled service to take a look at the project. 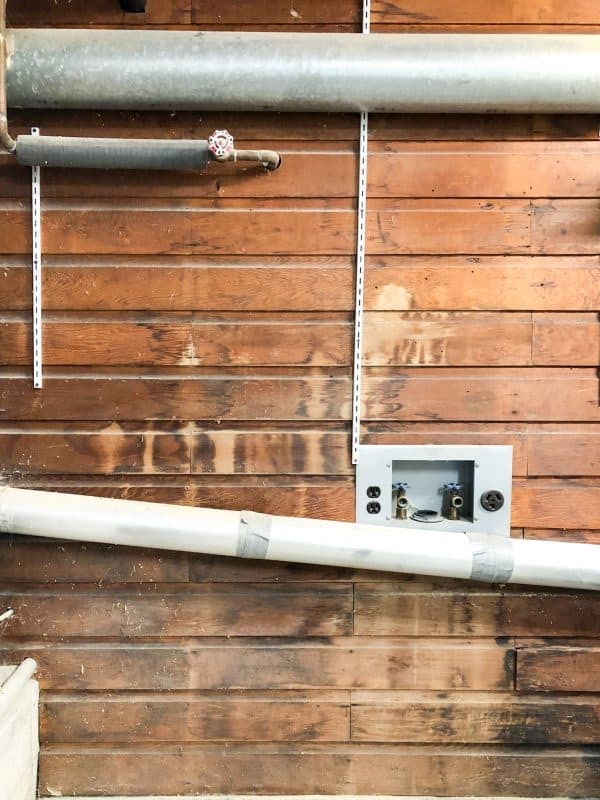 The other side of the bathroom wall is my workshop, which is an unfinished room that was once a garage. It’s not pretty, so I don’t mind cutting it up! There’s an old laundry hookup right next to the spot where the shower will go, so it would be fairly easy to reroute the plumbing. On installation day, the Mr. Rooter technician came prepared with everything he would need to access the wall and install the shower. Instead of drywall, the workshop is clad in tongue and groove planks (which I’ve been gradually covering up with white paneling to brighten up the space). 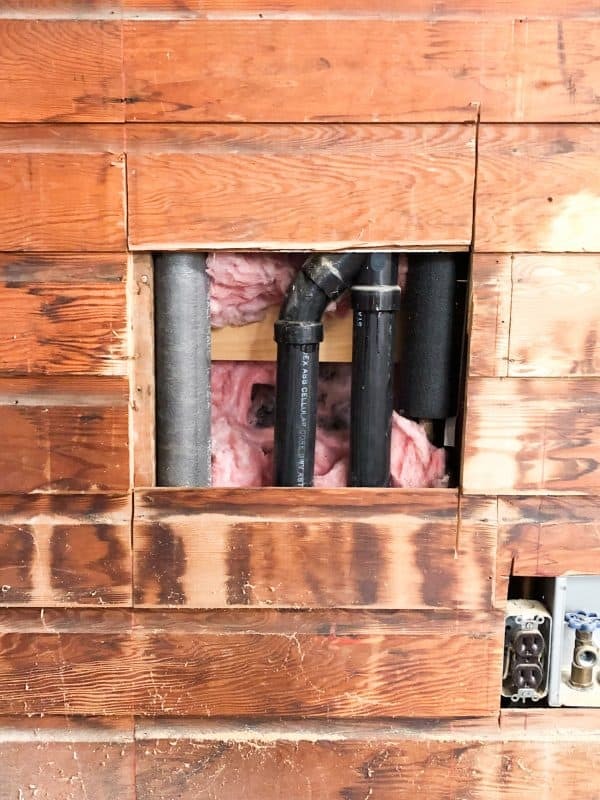 He cut along the studs with a circular saw to expose the pipes hiding inside. Apparently all the pipes for the house run in this one stud bay! If I had attempted to tackle this job myself, I would have run screaming from this mess! Luckily, the Mr. Rooter technician knew just what to do. 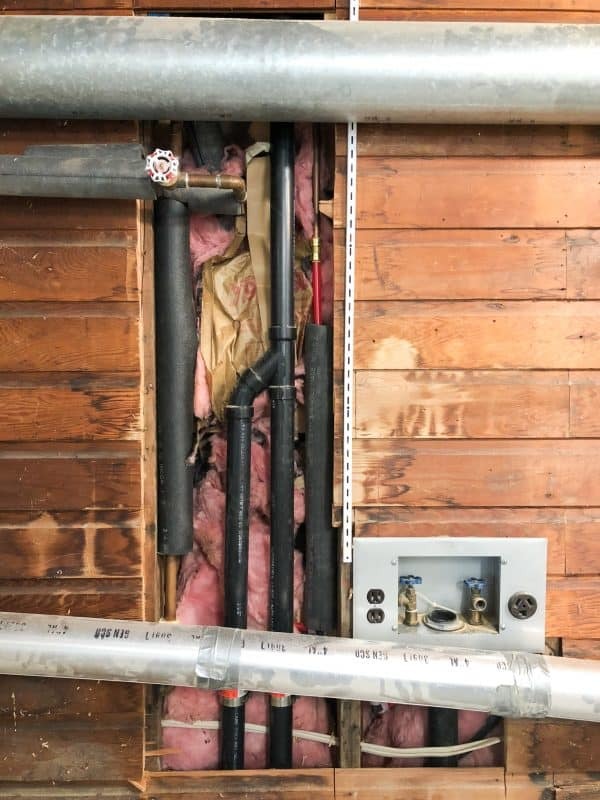 He removed more of the wall so he could see all the connections and assess where the shower head and valve would be installed. After turning off the water main, (which is hidden among the decor on my floating shelves), he got to work cutting the PVC pipes that were blocking access to the new shower location. The pipe with the knob is the cold line that runs outside to the sprinkler system. He tapped into the hot line through the washer hookup that is no longer in use. He connected both lines to the shower valve, which then continued up to the shower head. Everything went back into place easily, and he moved on to the finished side of the wall. He marked the spot for the shower valve from the finished side, centered over the tub drain. This height is easy to reach whether you’re sitting in the tub or standing for a shower. 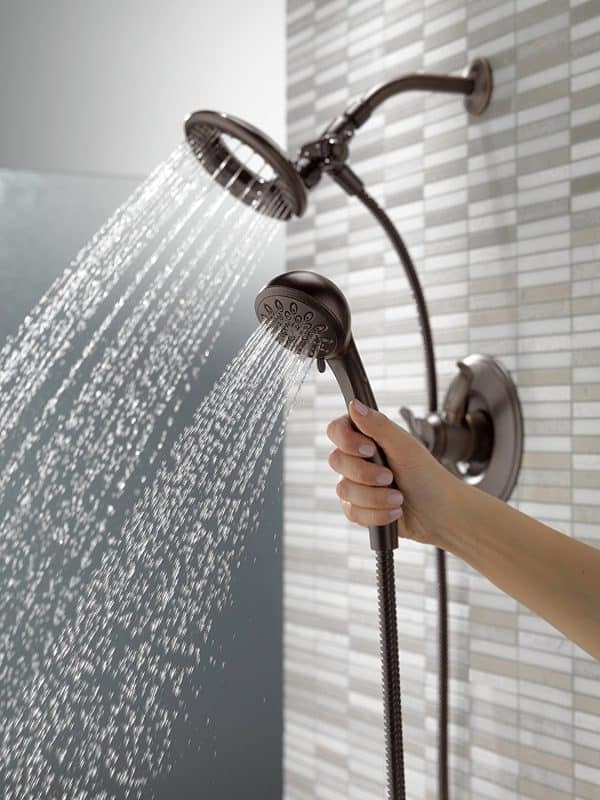 The dual function handle controls the temperature and water flow separately, so you won’t get a blast of cold water if you’re just rinsing off in the tub. The shower head was placed as high as it could go without running into problems with the low ceiling. The arm is long enough to extend over the bathtub edge, so water won’t drip onto the tiled deck when the shower is first turned off. Over time, the coil will relax and hang straight down. 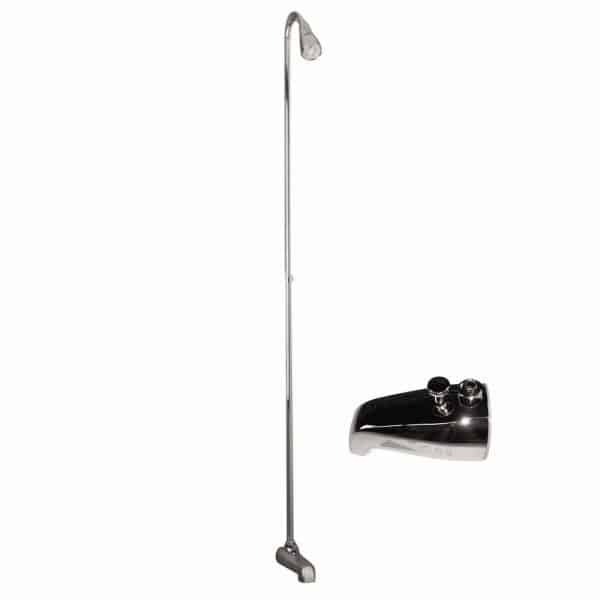 The detachable hand shower can be used in conjunction with the fixed shower head, or separately. It was exciting to finally see a functional shower in this bathtub! The walls are painted with Benjamin Moore Bath and Spa paint, which is specially formulated for damp environments. I plan to install a ring shower curtain rod around the perimeter of the tub to further protect the walls from splashes. A huge thank you to Mr. Rooter for making our house a two shower home! 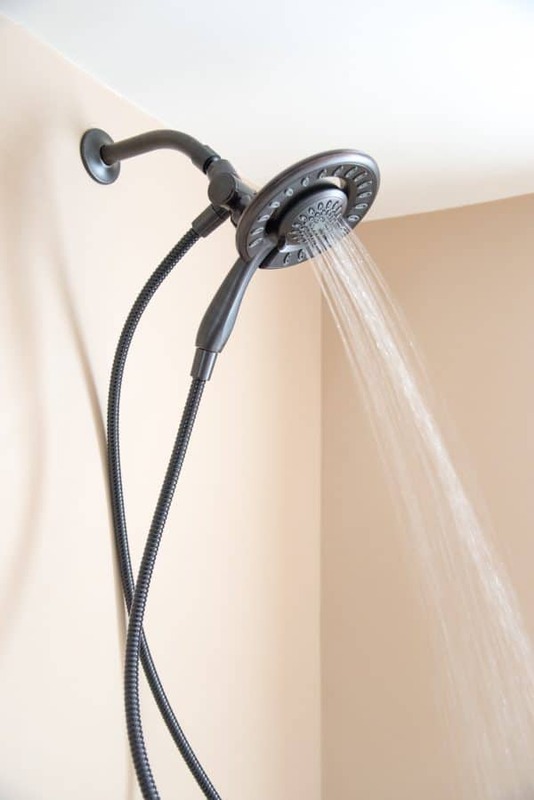 Now guests can have their own shower and mornings will go much smoother and quicker! If you would like to keep up to date with my latest posts about home improvement, woodworking and more, you can follow me on Facebook, Pinterest, or Instagram. You can also sign up for my email list below and get the latest post delivered to your inbox, plus exclusive access to my woodworking plans library! Thanks so much for sharing with us at the Summer Time Fun Linky. Pinned. 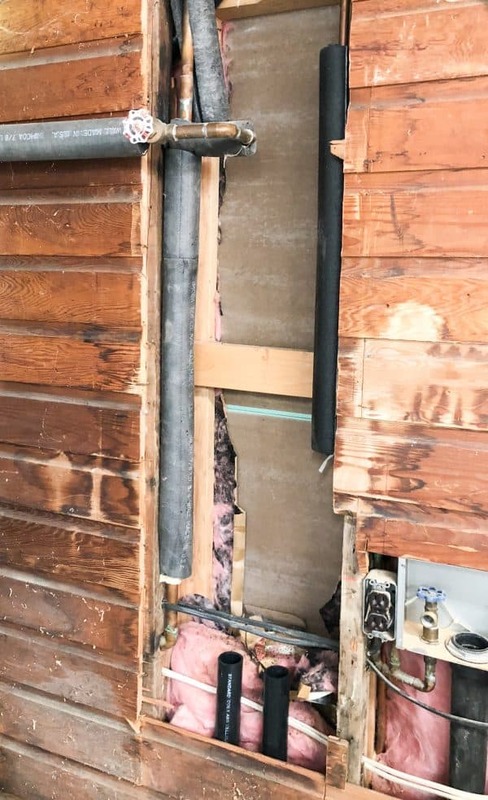 As long as you have caulk between the tub and the deck, it shouldn’t get underneath. I installed a hoop shower curtain hung from the ceiling to prevent water from getting around the outside, just in case! We just had our large jacuzzi tub refinished and we would like to add a shower. This helps me picture it. 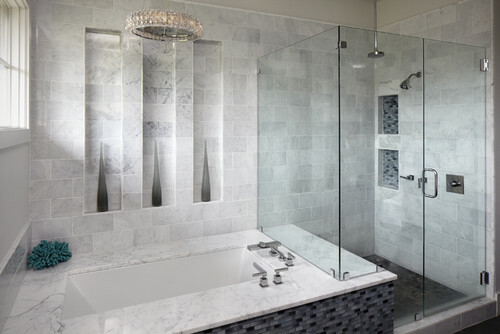 I really like that shower head with the detachable hand shower. Where can I find one? 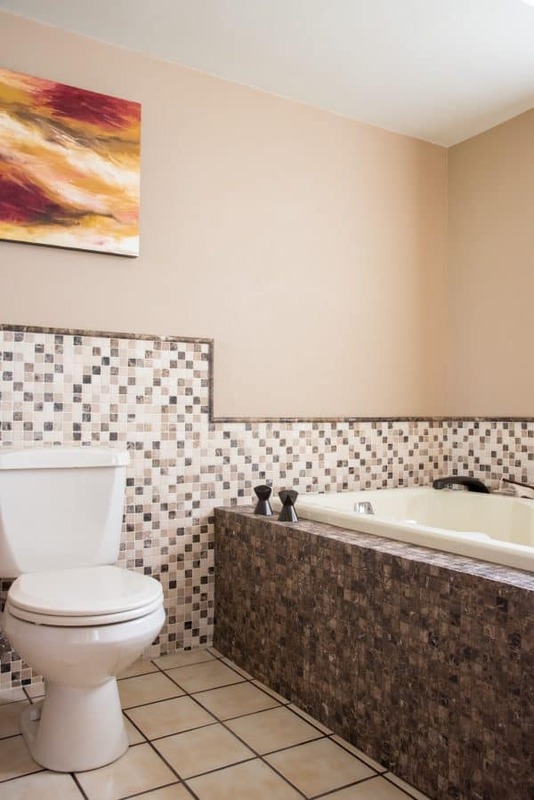 what was your budget for this project because I am interested in doing the same thing and my tub is oriented the exact same way. I think the budget will vary depending on the typical rate for plumbers in your area. Everything is expensive in Seattle, so the cost to have the shower put in was a little over $1,000.